A few weeks ago, my two remaining hens both became broody. My black Australorp, Maggie, took the safe course and laid her eggs in the chicken coop. 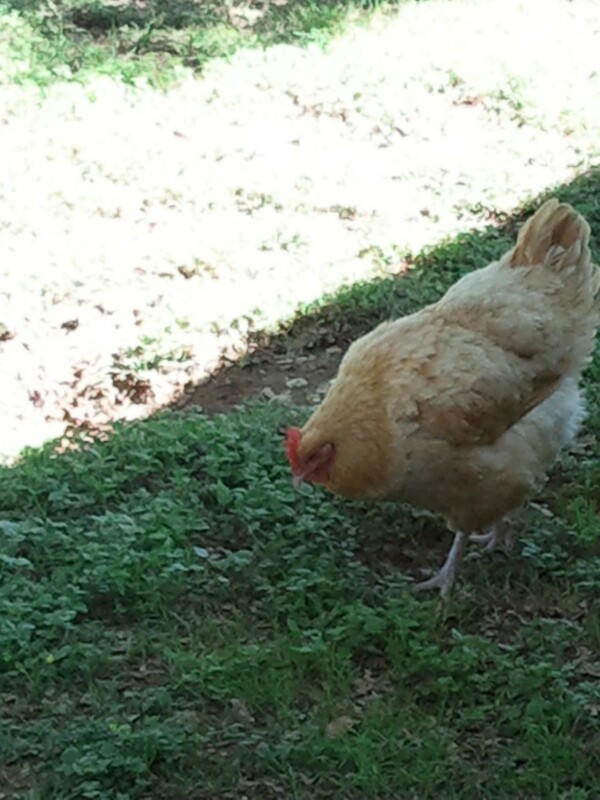 My Buff Orpington , Goldie, went a little wild and disappeared in the woods. After the required 21 days, Maggie hatched two little ugly chicks. She had been setting on four eggs, but two were chalk eggs, and much to her chagrin, did not hatch chicks. Goldie had been showing up every 3 or so days to drink water in the front yard and eat a little food. I was hoping she would show up with some little chicks in tow. Never happened. But then again, I kept thinking she wouldn’t show up at all and that would be that. Hasn’t happened yet. Yesterday, it seemed that it had been longer than usual since I had seen Goldy. It’s getting to be hot and dry as usual for July in Texas. I didn’t know how Goldy was making it in the woods for water. In the meantime, my son had finished the chicken yard and I had cooped Maggie and Billy up in the coop and yard, instead of letting Billy run around the yard and sleep on the picnic table on the back porch. That was an important move, because the back yard fence was also finished and my Great Pyrenees was allowed to run around at will in the back yard. She still thinks chickens are great … but probably for eatin’. Goldie hadn’t been around that much, so she probably wasn’t aware of the changes made in sleeping arrangements. I decided yesterday that if she showed up again, I should probably catch her and put her in the coop, so that I wouldn’t lose her permanently. Well, she showed up today, drank her usual water out of the pan in the front yard, eagerly ate the sunflower seeds I threw her, and laid around in the front flower bed. Being a wily bird, she would get up every time I came outside. I finally put a cat carrier with sunflower seeds in it in the front yard, hoping that she would go inside and I could catch her. Didn’t happen. She disappeared again. I gave up on her and decided she made a nice lawn ornament when she showed up and helped keep the bug population down. Imagine my surprise when I let my Pyr outside for the night and I noticed a strange lump on the picnic table. I tried to remember what I could have left there that was that shape. It looked like a ham-shape in a paper bag. Then I realized it was Goldie come home to roost. Unfortunately, she came home to roost on the picnic table in the back yard. And as I mentioned before, my Pyr probably thought she would make a nice picnic lunch. Before my Pyr could make a move for the table, I beat her to it and grabbed the hen. Holding her flapping wings down I made my way to the coop with both dogs following me. (Jonah, my shepherd/heeler mix, likes to herd animals, but poses no mortal danger to my hens.) In she went. I’m sure she was wondering who the new chicks were, but she settled down in the corner by the door. I guess she realized it is just a little dry right now to stay in the woods. I’m glad to have her home. Hopefully, she will settle in and won’t try to roam again.